How well do you read people? Are you good at interpreting group dynamics? Being able to read your organization is an art as well as a science. I have spent my adult life studying groups of people to understand where their levers for positive change might be. Being able to understand the feelings and motives of groups starts with the practice of “reading” individuals. Try this fun quiz to see how well you can read people when you can see only their eyes. The results may be eye-opening. 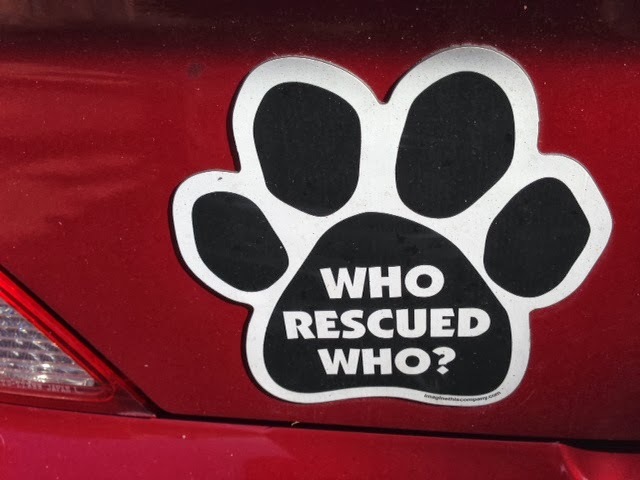 While walking my dog, Elvis, a few days ago, I saw this bumper sticker that resonated with me on multiple levels. All of my pets over the years have been rescued from local shelters, and in every case I felt that they indeed rescued me from a more self-centered life to one where their needs required my attention regardless of what was on my agenda. The companionship they’ve provided (along with other unexpected benefits like protection from intruders) is immeasurable. On another level, the same can be said for friends and colleagues. Many times they don’t realize that what I get from them is immeasurable. Sometimes it’s harder to accept help or appreciation than to give it. Those who “rescue” others—especially for a living—need to balance their lives by recognizing and embracing all they receive from others. I truly feel that my friends and colleagues have rescued me from so many things. I don’t remember feeling lonely, bored, or unloved. Their constant connection buoys my spirits, even when I’m in a tough patch, which everyone naturally experiences as part of the cycle of life. Find ways to connect with others. Take time to say, “thanks.” Smile at people you pass. Listen to what’s worrying a friend, even if it’s not your worry. Walk down to the cubicle of that colleague who just emailed you and connect with her face-to-face to increase the likelihood of a positive result. Find ways to appreciate the many gifts you are given every day. A practice I have found helps me put my life in perspective and shift gears at night is to relax before bedtime and mentally count all the things I can remember from the day for which I am grateful. Try it and let me know what happens. We should all be there to “rescue” one another. The "Redskins": A Brand at What Cost? In my new book, HUM, I explain why an organization’s brand should not only be strong, but must be authentic and reflect the organization’s core values in order to successfully reach its true potential. Among the many reasons for organizations to spend the time and energy defining, designing, aligning and refining its brand is that business developments and changing times will inevitably challenge every organization’s brand at some point. In my book, I discuss how Apple and National Geographic have each successfully adapted their businesses to their respective evolving business markets while staying true to their brand. But, what happens if an organization’s leaders believe that its brand is entirely dependent upon its past successes, traditions, and even its own name? What if an organization feels that any change to its name would jeopardize its brand and risk alienating the loyalty of its consumers and fans, despite the knowledge that the name itself has become widely recognized as offensive? Is it possible for an organization with a brand so rooted in the past to have a future? Is it possible that the organization’s leaders have defined the brand too narrowly? As any football fan could guess, a great example of this issue is the ongoing debate over the controversial name of the Redskins franchise. The article below, written by Jack Baer, my oldest godson, first appeared in The University of Wisconsin-Madison’s newspaper, The Daily Cardinal, on October 7, 2013. He argues that it’s time for the Redskins name to go. The debate over the use of Native American mascots in schools is now up for debate in the Wisconsin Legislature. This is a complicated issue that pits what some would call the irrationality of sports fandom and tradition against the pain of one of the most downtrodden groups in American history. Before that debate can be fully engaged however, we need to talk about the Washington Redskins. Because as long as we discuss the morality of Native American mascots, the Redskins will loom large as a truly brutal example of what continues to be defended by sports fans. The Random High School Indians or the Whatever Prep Chiefs won’t really seem that bad as long as the Redskins continue to exist under their current name. It’s like complaining about a leaky faucet when your basement is flooding. I grew up in the Washington D.C. area. I’m a Nationals fan, I’m a Capitals fan, I’m a Wizards fan, and I’m a Ravens fan. I’m not a Redskins fan, and the name is a big reason why. Rooting for what was pretty clearly a racial slur just felt creepy to 12-year-old me. 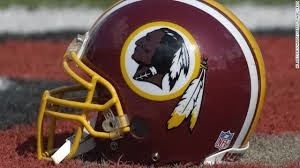 Maybe it would be okay if the Redskins were partially owned or operated by Native Americans, or at least named by Native Americans. But the reality is the Washington Redskins have always been run by white people, and some notoriously racist white people at that. The man who brought the Redskins to D.C., George Preston Marshall, flat out refused to sign a black player onto his team until 1962. He only buckled when two cabinet members threatened to revoke the Redskins stadium, which was paid for by the government. When Marshall was lying on his deathbed in 1969 he asked for a foundation to be set up in his name, under the stipulation that not a penny would go to any purpose supporting racial integration in any form. This is the man who named the Redskins. Maybe the name would be even slightly defensible if it were coined by some sort of Native American interest. But the fact stands—they were named by one of the most disgusting racists in sports history. Because of that and so many more obvious reasons, it’s pretty clear the time has come for notoriously stubborn Redskins owner Dan Snyder to change the name. President Barack Obama believes it, saying he would consider changing the name if he were Snyder. Bill Simmons and Peter King, two of the most influential sportswriters in the world, believe it, even going so far as to refuse use of the name in their columns. Snyder can cite tradition, flawed opinion studies of Native Americans and a fake “American Inuit chief originally from the Aleutian Tribes of Alaska” (seriously, google this, the guy’s name is Chief Dodson) all he wants. The day I believe Snyder truly has no problems with the name is when he invites a Native American tribe to FedEx Field and freely calls them by the moniker he himself has judged to be non-offensive. Until then, Snyder is just an owner of a badly named business which he’s too stubborn to rebrand. Unless he reverses course, and quick, we’re going to remember Snyder in the same light as Marshall, a man embarrassingly behind the racial realities of his time. Those of you who have worked with me know I have loved the Gallup work on strengths-based leadership, management, and personal development from its inception almost forty years ago. One of my clients asked me to tie strengths-based leadership into their upcoming strategic planning retreat a few weeks from now. 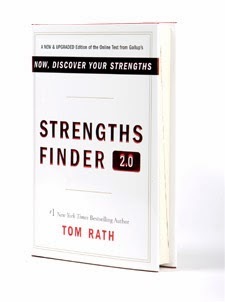 Every board member was sent a copy of Tom Rath’s Strengths Finder 2.0, a great summary of the research supporting strengths-based development (actually, as Tom points out, it’s really “talents based” development, as we have the responsibility to invest in our talents in order to turn them into strengths.) The book also provides definitions of the 34 identified strengths, with examples and steps for improvement for each. The best part, though, is that each book comes with an access code to a website where you can take a reliable, valid inventory that reports to you your talents, along with ideas about how to apply and develop them. It’s bound to open your eyes and make you feel great. Each of the participants in our upcoming board retreat will have taken the inventory and read Strengths Finder 2.0 before they attend the meeting. We will use their results as a springboard for discussing the strengths members see in one another as well as in themselves, and how these can be used in complementary ways to achieve their business goals. I confess that I can’t understand why more organizations don’t take the strengths-based approach instead of focusing on what each person lacks, insisting they overcome their weaknesses, or simply ignoring their talents. I was observing just such an organization recently, where roles were rotated automatically around the group, so each member was required to serve as chair, treasurer, secretary, etc.—regardless of where their talents were. It was painful to watch, especially since the assumption was that this approach was very egalitarian—giving everyone equal opportunity for each role. Imagine a baseball or football team where every member rotated through each position! High performance can only be achieved and sustained when members are encouraged to play to their strengths. Yet, over the past decade, more than 10 million people have reported to Gallup about how they’ve been engaged at work, and only one-third “strongly agree” with the statement: “At work, I have the opportunity to do what I do best every day.” And, of course, for those who don’t get to play to their strengths every day, the costs are staggering—for them as individuals, for the teams on which they serve, and for the organizations which employ them. Do you know your strengths, and do you get to use them at work every day? If you have any doubts, pick up a copy of the book and take the inventory—it just might lead you in a new career direction! I have always admired individuals and organizational leaders who can create something magical with whatever they’ve got. I’ve seen this talent used to create delicious, memorable meals. I’ve seen it applied to the creation of a breath-taking garden that reveals new dimensions throughout the seasons. And I’ve seen organizations that resist making excuses about what they don’t have, instead using the people and resources they do have to achieve good in the world. Today, I am especially moved by the accomplishments of Brooke Curran, who in 2009 created a nonprofit, RunningBrooke, to raise money for the children of Alexandria by running marathons. In brief, her goal for Phase One was to run the major marathons in the world along with one in every state and one on every continent. She will achieve this goal this month, having raised an amazing amount of money to champion healthy kids to develop the skills and habits they need for success in school and life. 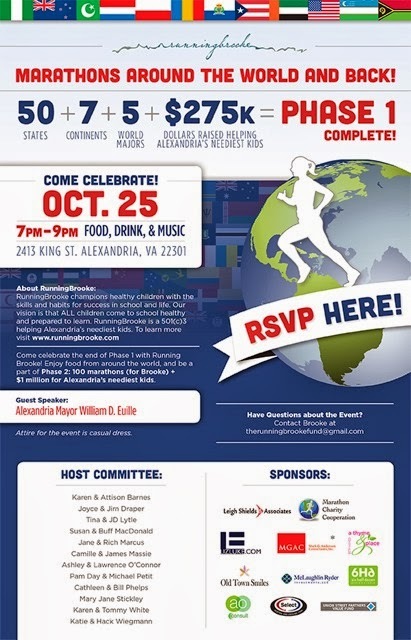 The celebration of her completion of Phase One will be at Brooke's house October 25, 7-9pm with food from around the world, wine, beer, music, and lots of fun! For more information or to buy tickets online, visit www.runningbrooke.com. Be prepared to be completely inspired and motivated to get more out of yourself when you witness how Brooke has pushed herself to accomplish this personal challenge in order to deliver on her goals. And what happens after Phase One? Visit her website to learn about what she plans to do in Phase Two! Brooke epitomizes for me someone who takes what she’s got and applies it in the service of others. I have never heard her complain. She is always energetic and focused on the next marathon that will get her closer to her goals. She has a strong board behind her that helps her make sure the funds she raises are given to worthy projects to advance RunningBrooke’s mission. Keep on runnin’, Brooke. You’re truly an inspiration!